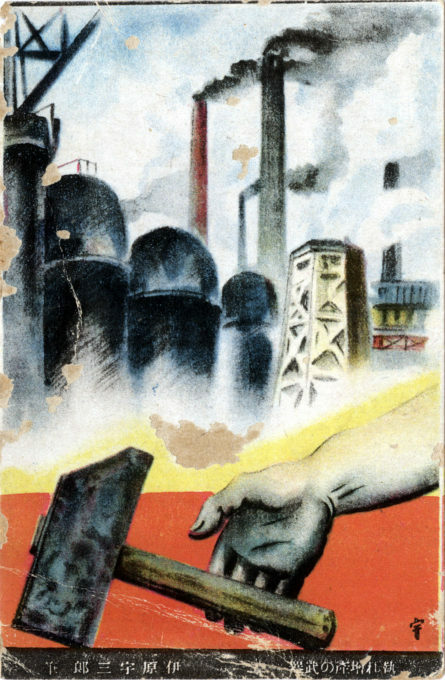 “Grab the weapon for production increase”, propaganda postcard, c. 1940. Commercial art by Usabura Ihara. Published by the “Supporting Society of Kokumin Choyo (Citizen Mobilization, Requisition)”. “Resentment against laiseez-faire capitalism had existed in various circles in Japan throughout the 1930s. ‘Reformist’ military officers and ‘revisionist’ bureaucrats advocated government control of the economy, to ensure better living-standards for peasants, and to mobilize more resources for war. Under the wartime conditions, which developed after 1937, these plans could be carried out. “In August 1939, the Diet passed the Major Industries Association Ordinance, which empowered the government to set up ‘control associations’ (toseikai) in vital industries. The government’s control of industry, like the control of the population at large, was to be exercised through a mechanism of self-supervision. The toseikai was a compulsory cartel, under the ‘guidance’ of a government ministry, for allocating raw materials and setting production quotas for its members.